My aunt - Helen Kay Schunck (1894-1978) was a secretary at the Beam School of Aviation in Celina OH when Billy Brock was an instructor there. 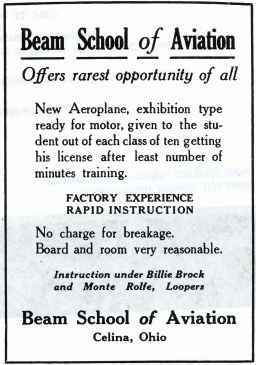 Helen cited Billy in one of her many aviation articles (1927-1931), one in the Saturday Evening Post of Nov 5, 1927. I've found that L.M. Monte Rolfe, Ward Beam (of air and auto thrill show fame), and Henry Wong (who may have become a General in the Chinese Air Force) were all associated with the school. 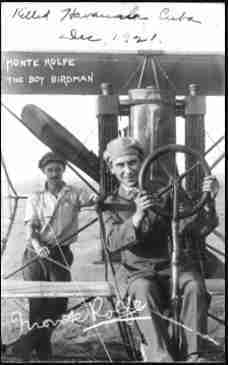 (Monte was killed in a crash in Havanna Cuba in 1921 after notable service in WW I and working with pioneer Georgia aviator Ben Epps). So the school had much to show for itself, but the Mercer County historian Joyce Alig and I are stymied in our search for more records of people from the school and questions such as "Why did it close and when did it close?" If you know of more names of alumni or the names of living relatives of alumni, please let me know. ONLINE RESOURCES Using the Google search engine on "Monte Rolfe", you will find only five links. Four of them are useful in understanding a few incidents in his history. You may want to use the FIND function on "Rolfe" to locate the scattered references. 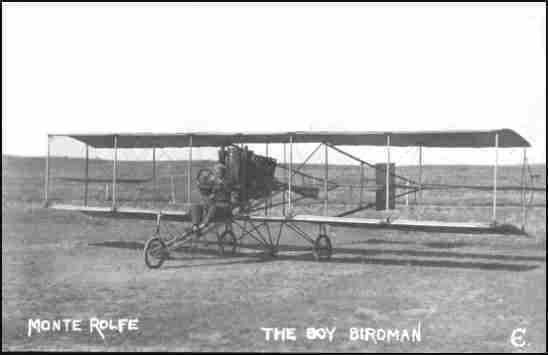 September 5, 1921 Monte Rolfe, one of the best known pilots in the United States, was killed in an aeroplane accident at Havana, Cuba on August 15, 1921. No details of the accident are available. Rolfe was born in England, where he learned to fly. He had been in the United States since 1917 and had a very wide circle of friends. He was a skillful pilot, with an excellent record, and his death is a distinct loss to American aviation.